Vinicio "Vinny" Castilla Soria (Spanish pronunciation: ; born July 4, 1967) is a Mexican-born former Major League Baseball third baseman who played his best years with the Colorado Rockies and Atlanta Braves. Previously, he played with the Atlanta Braves (1991–1992, 2002–2003), Colorado Rockies (1993–1999, 2004, 2006), Tampa Bay Devil Rays (2000–2001), Houston Astros (2001), Washington Nationals (2005), and San Diego Padres (2006). Castilla was a member of the inaugural Colorado Rockies team that began play in Major League Baseball in 1993 and was a huge favorite among Rockies fans. Castilla hit 40 home runs in both 1996 and 1997, 46 in 1998, and compiled five 100+ RBI seasons, leading the National League with 131 in 2004. He helped to lead the Rockies to their first-ever playoff appearance in 1995 and remains in the top ten in many offensive categories for the Rockies. In 1996, he and teammates, Andrés Galarraga and Ellis Burks became just the second trio of 40-homer teammates in MLB history, and the three of them, along with Dante Bichette, became just the third 100-RBI team-quartet in MLB history. In 2002, he had the lowest range factor among all NL third basemen (2.44). Castilla, having one of the worst seasons of his career, was released by the Padres on July 19, 2006, to make room for pitcher Mike Thompson. On August 14, the Rockies signed him to a minor league contract and he was recalled from the Colorado Springs Sky Sox on September 1, 2006. On September 28, in a game against the Dodgers, Castilla had a pinch-hit RBI single in his last at-bat at the Rockies' home stadium, Coors Field. 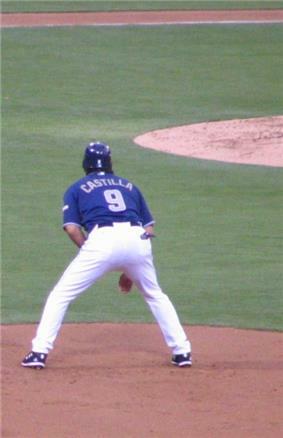 Castilla was the last active player from the Rockies' inaugural season in 1993 at the time of his retirement. He decided to retire after the Caribbean Series on February 7, 2007, becoming a special assistant to Rockies GM Dan O'Dowd. Castilla and his wife, Samantha, have 3 sons, Vinicio Jr., Daulton and Cristian. In 2007, he was named manager of the Mexico baseball team for the Pan American Games and also served as manager in the 2009 World Baseball Classic. In 2008, he was a player-manager for the Naranjeros de Hermosillo in the Mexican Pacific League. ^ "Atlanta Braves Biography". MLB.com. Retrieved December 7, 2008. ^ "Vinny Castilla retires, joins Rockies front office". cbc.com. February 7, 2007. Retrieved December 16, 2008. ^ MLB Stats, Bio, Photos, Highlights. ^ "Vinny Castilla to manage Mexican national team". espn.com. Associated Press. February 28, 2007. Retrieved December 16, 2008.